Week 7 was a mixed bag for the FANFOOD 2 for 2. Out of 4 starts, half of them were quality. 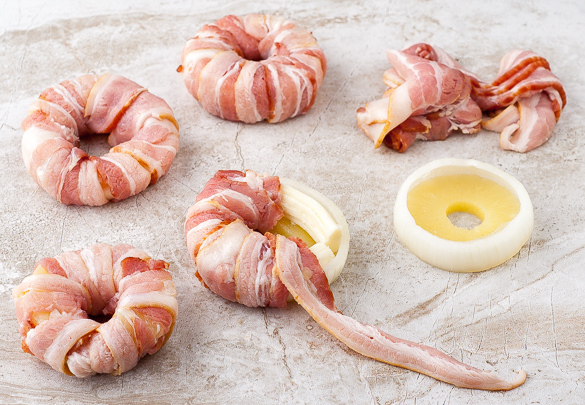 Here are the results followed by a great recipe, this time it’s Bacon-wrapped Pineapple Mozzarella Rings. Hiroki Kuroda picked up his third win Sunday against the Pirates. Kuroda started Game 1 of the team’s double-header. Home runs hurt Kuroda, but he was otherwise fairly solid. Both Neil Walker and Tony Sanchez clubbed solo shots during the game. Walker struck again, singling in a run during the fifth. Despite some of those issues, Kuroda was able to turn in a quality start. He lasted six innings, giving up three runs on five hits. He walked two and struck out seven. Kuroda’s record is now 3-3. His next start will come against the White Sox. In his other start of week 7, Hiroki didn’t factor into the decision after giving up four earned runs on seven hits in six innings and striking out three in his team’s 9-7 loss to the Mets. Kuroda was touched up for two home runs in the middle innings Monday after giving up just four home runs in his first six starts, but he was on track for the win before the bullpen let him down in the seventh and eighth innings. Dan Haren had a hard time keeping the ball in the park on Sunday, suffering his second loss of the season in a 5-3 defeat to Arizona. He allowed five runs — four earned — on 10 hits and no walks while striking out three in six innings pitched. In his first start of the week, Dan Haren earned a win Monday, giving up three earned runs on seven hits in seven innings while striking out two in his team’s 6-5 win over the Marlins. He gave up a run on a groundout in the first inning and then two more runs in the third, one on a solo home run, but that was the extent of the damage. Peel and cut the large onion into 1/3 inch slices. 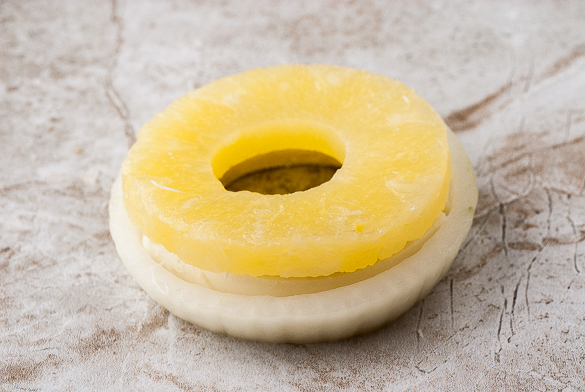 Open the can of pineapple slices, drain the juice and set aside 8 slices. 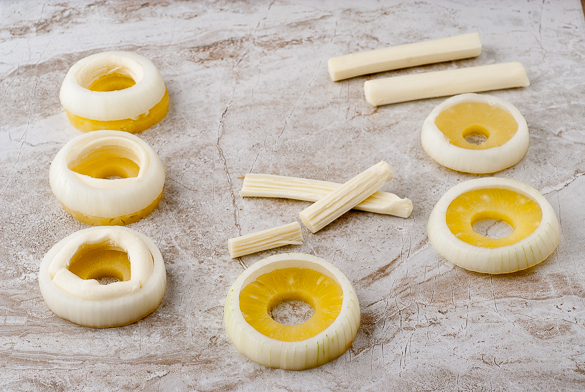 Match the onion rings to the size of the pineapple slices—choose rings that have more of a bowl shape to help hold the string cheese in place. 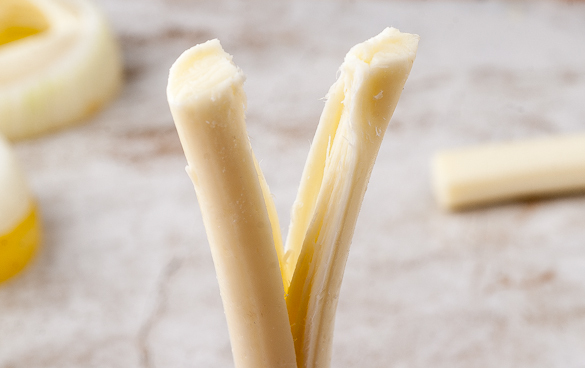 Tear the mozzarella string cheese in half. 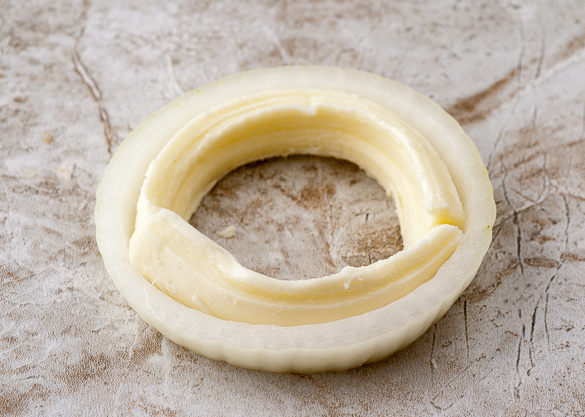 Place one half of the mozzarella in the onion ring and cut the other half to fill in the remaining gap. Place the cut piece filling in the gap. 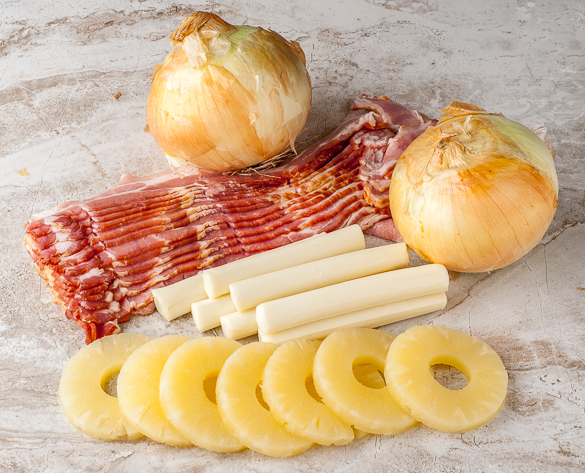 Stack the mozzarella lined onion ring on the pineapple and start wrapping with bacon slices. 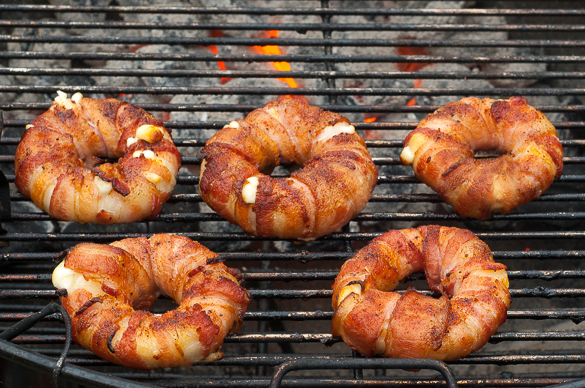 Use two to three slices of bacon per ring. Just take it slow and keep it all in place and it will eventually wrap—sometimes it takes some repositioning or restuffing of string cheese into ring. Start up the Weber kettle (or your grill of choice) and cook indirect at 400F for 30 minutes. 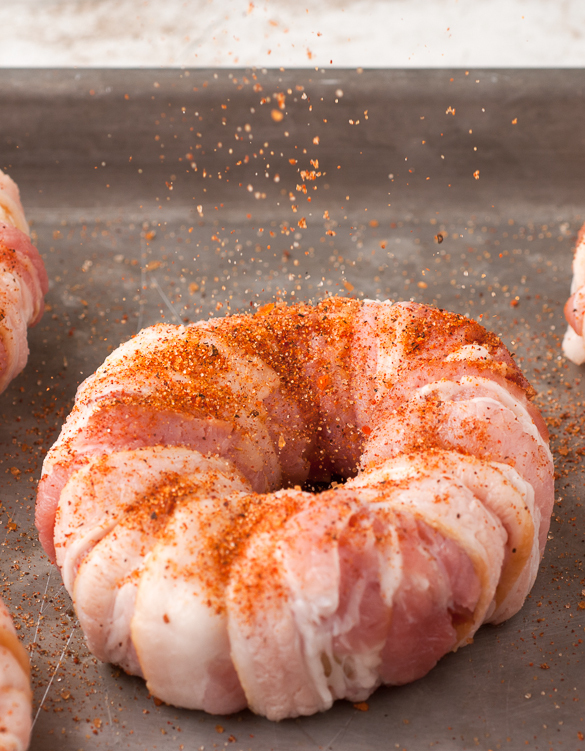 Optionally glaze with your favorite sauce. Let cool down for a few minutes before serving. 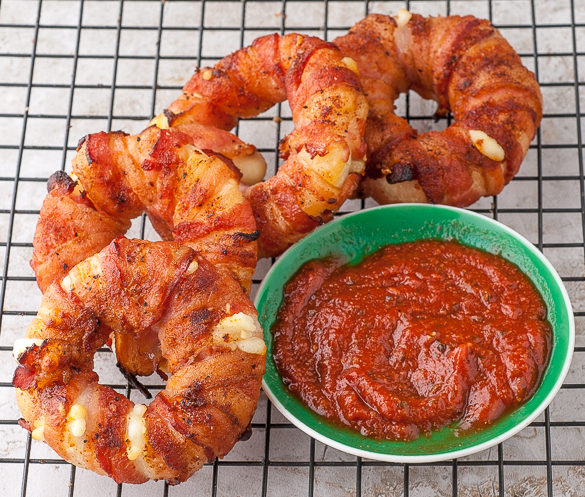 Serve with your favorite dipping sauce, such as marinara.